United Arab Emirates, Dubai – 1st May, 2016: Boehringer Ingelheim, one of the world’s leading pharmaceutical companies held its 2nd Stroke Academy in Dubai this year attended by more than 200 cardiologists, neurologists and strokologists from across the Middle East and Africa region. The program of the academy aimed at discussing stroke related diseases and therapies from prevention to treatment. The event served as a platform for leading cardiologists to shed light on Atrial Fibrillation (irregular heartbeats) as one of the main cardiovascular diseases causing stroke. It also discussed the overall disease prevalence, the rising number of patients, the new era oral anti-coagulants as required treatments for Atrial Fibrillation patients as well as recent Real World Data and studies related to Oral Anti Coagulates in an aim to update the wider community, including healthcare professionals. Atrial Fibrillation is the most common sustained heart rhythm condition, where blood can pool in the heart's upper chambers (atria) and form blood clots. If a blood clot forms, it can dislodge from the heart and travel to the brain, obstructing the flow of blood to the brain and causing a stroke. Blood clots can prevent flow of blood to other organs as well. In patients with irregular heartbeats, the normal control of heart rhythm by the sinoatrial node is disrupted, leading to rapid and irregular electrical signals (tachyarrhythmia). This causes the upper chambers of the heart (atria) to quiver rather than contract in a coordinated fashion, reducing the efficiency with which blood is pumped from the atria to the ventricles and potentially leading to blood stasis (pooling) and blood clot development. Moreover, Ischaemic strokes are the most common type of Atrial Fibrillation related stroke, which frequently leads to considerable disability and possibly death. As atrial fibrillation commonly occurs in association with risk factors, such as hypertension, diabetes and ischaemic heart disease, opportunistic assessment of such patients for the presence of atrial fibrillation may be prudent, especially as patients are often seen for check‐ups in primary care. The prevalence of Atrial Fibrillation in the Middle East stands at 15%. However, Africa is lower than other regions in the developing world with only 1.6% to 6.9% in stroke patients, 4.6% to 5.5% in cardiology patients. “In addition, prevention of ischaemic stroke in Atrial Fibrillation remains a treatment priority, for which anticoagulation therapy is essential. New Atrial Fibrillation treatment guidelines issued by the European Society of Cardiology in 2012 reinforce the importance of anticoagulation for stroke prevention in patients with Atrial Fibrillation. The guidelines state that all Atrial Fibrillation patients at risk of stroke as defined should be considered for oral anticoagulant treatment . Large Scale Real World Data is also crucial in choosing a new oral anti-coagulant as both physician and patient can ensure higher drug safety profile,” added Dr. Bazaragani. 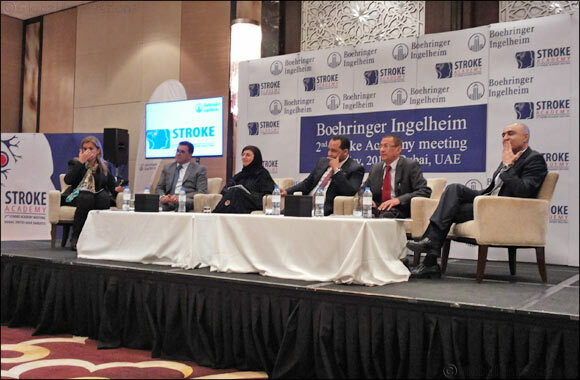 The Stroke Academy included workshops, debates and a panel discussion that focused on stroke prevention and treatment where leading medical insight was shared from different countries across the Middle East and Africa.